Playing in the DADGAD tuning Roger Kahle has accompanied fiddle music in the Irish, Cape Breton, Scottish, Quebec and Old Time genres. Known as 'Shindy' with fiddler Randy Miller, Roger has appeared in numerous house concerts and played contra dances through out New England. Other noteworthy appearances have been at NEFFA, North East Heritage Camp, Down East Festival, Northern Roots, Star Island and Revels North. 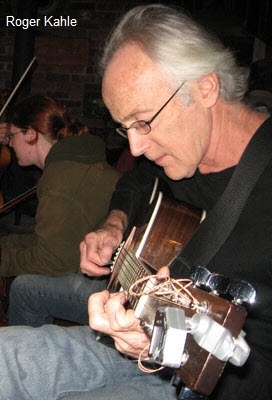 He was the guitarist in Beeswax Sheepskin a touring East Coast contra dance band and also toured with Scottish fiddling champion Jeremy Kittel. Teaching DADGAD workshops over the years he has worked to demystify the complexity of back up; most recently at 'Hanover Strings' music store in Hanover New Hampshire. Roger also plays mandolin and is a foot percussionist.